MORRIS HEIGHTS — The grieving family of a 9-year-old boy who tumbled to his death off their high-rise apartment building was looking for answers Thursday about the mysterious incident. 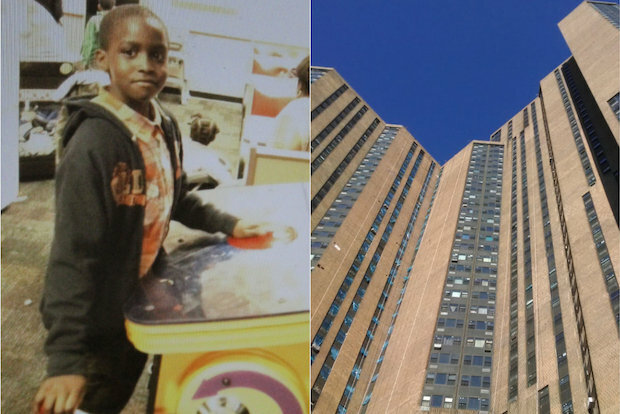 Sidy Fofana — a fourth grader at Harlem Success Academy who loved soccer and wanted to become a dentist — was found lying dead atop scaffolding at the base of the tower about 5 p.m., police and family said. He was pronounced dead at the scene. The distraught parents, who emigrated from Mali 14 years ago, said they last saw Sidy when he left their fourth-floor apartment at 20 Richmond Plaza about 4:45 p.m. to go up to his uncle's apartment on the 43rd floor to pick up $10 to buy chicken wings and french fries as he had done numerous times before, they said. 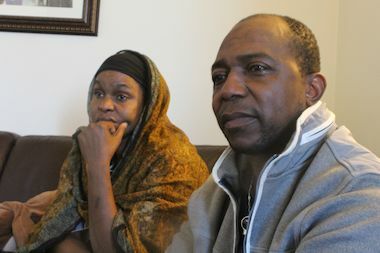 Mother Sanata Diakite, 42, and father Gaoussou Fofana, 50, sought answers after their son was found dead after falling 43 stories from a Bronx apartment tower. They asked Sidy, one of five children, to wait for his brother, but he insisted. "He said, 'Mommy, I can go and I'll come back,'" said his grieving mother, Sanata Diakite, 42. "He just wanted to get the food for his uncle." "He was supposed to come back in 30 minutes, but he never came back," the mom said. Sidy then made his way to his uncle's door 39 floors above. "He came to my door and my wife gave him the money," said his uncle, Boubacar Fofana, 56. "That's the last time we saw him. He never made it. I'm the one who spoke to him last." It was unclear what happened in the next few moments and investigators were poring over video surveillance in an attempt to determine what happened. But sources said that many of the cameras were broken. Investigators believe Sidy, who had a history of wandering off, made his way to the roof and fell off accidentally, sources said. His father said there was no lock or alarm to bar access to the roof and pointed out that it was exceptionally windy Wednesday evening. He also said that he didn't know of any instances of his son making prior trips to the roof. At 5:05 p.m. someone called 911, police said, and Sidy was discovered on the scaffolding. It was not clear if foul play was involved. The Medical Examiner expected to have autopsy results for the boy later Thursday, a spokeswoman said. Diakite learned her son died when police knocked on her door about 5:15 p.m., she said. She grabbed an iPad she had given him days earlier as a reward for doing well in school and pulled up a photo of Sidy, she said. "They asked me what my son looked like and how old he was and what my son was wearing. They showed me the picture of my son's body and asked if that was my son. That was him! That was him!" Sidy's mother said, beginning to weep. Family gathered at the fourth-floor apartment and remembered the boy fondly. "He was very brilliant. He was great at math, great at science," Diakite said. "He was a good student. It's unbelievable. He was not sick. He loved his family so much." His father, Gaoussou Fofana, 50, a worker at Gristedes, called Sidy a "very sweet boy, smart. He just liked people." "He was a normal kid. He liked to play soccer. He wanted to be a doctor or a dentist," his grieving mom said. She remembered a trip to the dentist when he was 4. The dentist was also from West Africa, and little Sidy was immediately inspired. "'Mommy, I want to be like him," he said. 'That's what I want to be,'" Diakite said. A spokesman for the building, Ronn Torossian, said that they were required to keep the door to the roof open because it was a fire exit. He did not immediately have details about whether the exit was alarmed. “Our condolences are extended to the family on their tragic loss," Torossian said in a statement. "We are cooperating fully with the NYPD investigation."